This is a phase angle control of a Triac which is a evolution from an SCR. The 50 Hz or 60 Hz Sine wave of mains can be turned on at any point after the Zero Crossing. The Voltage ramps up in the sine wave which gives a near "Linear" slope which can be used to trigger the ON at a time delay after zero crossing when the voltage is zero. This is like a PWM but works on low frequency only. Some of the early SMPS(HV for TV and Mains Inverter) by Siemens were built around SCRs. Turning off a SCR is a difficult job for a designer, MOSFETS and IGBT are now used for PWM drive stages. You can use it with a bulb to vary brightness of bulb, this is a live circuit it can give a shock, enclose in plastic box, the pot should have a plastic knob, use a fuse, you can also use it for temperature control of soldering irons. This is a DC controlled Solid State Relay which can turn 230V AC equipment on and off. The output is like a NO normally open contacts of a relay and have to be in series with the Load like any other switch. This should not be used for large inductive loads like big motors. The Q1 transistor limits the current thru the LED by providing an alternate path for more current. The DC input can be from 3V to 20V. 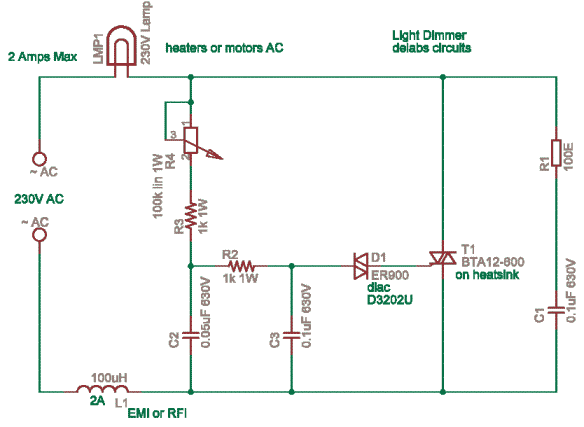 The Triac can be chosen depending on current in the load. Look for datasheets and applications at STMicroelectronics for BTA41600 triacs. MOC3041 zero crossover opto-diacs. 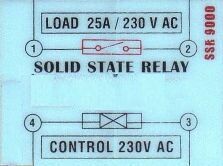 Read more at my main page - Solid State Relays - SSR I used to make them long ago.